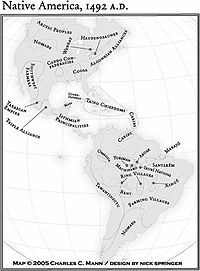 1491: New Revelations of the Americas Before Columbus is a 2005 non-fiction book by American author and science writer Charles C. Mann about the pre-Columbian Americas. It was the 2006 winner of the National Academies Communication Award for best creative work that helps the public understanding of topics in science, engineering or medicine. The book presents recent research findings in different fields that suggest human populations in the Western Hemisphere—that is, the indigenous peoples of the Americas—were more numerous, had arrived earlier, were more sophisticated culturally, and controlled and shaped the natural landscape to a greater extent than scholars had previously thought. The author notes that, according to these findings, two of the first six independent centers of civilization arose in the Americas: the first, Norte Chico or Caral-Supe, in present-day northern Peru; and that of Formative-era Mesoamerica in what is now southern Mexico. (a) population levels in the Native Americans were probably higher than traditionally believed among scientists and closer to the number estimated by "high counters." (b) humans probably arrived in the Americas earlier than thought, over the course of multiple waves of migration to the New World (not solely by the Bering land bridge over a relatively short period of time). The level of cultural advancement and the settlement range of humans was higher and broader than previously imagined. The New World was not a wilderness at the time of European contact, but an environment which the indigenous peoples had altered for thousands of years for their benefit, mostly with fire. These three main foci (origins/population, culture, and environment) form the basis for three parts of the book. In the introduction, Mann attempts to refute the thesis that "Native Americans came across the Bering Strait 20,000 to 25,000 years ago, and they had so little impact on their environment that even after a millennia of habitation the continents remained mostly wilderness." Mann first treats New England in the 17th century. He disagrees with the popular idea that European technologies were superior to those of Native Americans, using guns as a specific example. The Native Americans considered them little more than "noisemakers", and concluded they were more difficult to aim than arrows. Noted colonist John Smith of the southern Jamestown colony noted that "the awful truth ... it [a gun] could not shoot as far as an arrow could fly". Moccasins were more comfortable and sturdy than the boots Europeans wore, and were preferred by most during that era because their padding offered a more silent approach to warfare; canoes could be paddled faster and were more maneuverable than any small European boats. Mann explores the fall of the Inca Empire and attempts to assess their population compared to the armies of conquistadors, such as Francisco Pizarro. He discusses the importance of the large number of newly introduced infectious diseases and the likelihood that these played a far more significant role in the Native American decline than warfare or other actions by Europeans. He notes that while Europeans probably derived less benefit from their possession of horses than expected, as e.g. the stepped roads of Inca settlements were impassable to horses, the Inca did not maximize their use of anti-horse inventions to stop the Spanish intruders. The Inca Empire collapsed because by the time Europeans arrived, smallpox and other epidemics had already swept through cities, due mostly to the natives' lack of immunity to Eurasian diseases. The contrasting approaches of "High Counters" and "Low Counters" among historians are discussed. Among the former, anthropologist Henry F. Dobyns estimated the number of pre-Columbian Native Americans as close to 100 million, while critics of the High Counters include David Henige, who wrote Numbers from Nowhere (1998). Mann then goes into the provenance and dating of human remains that may shed light on the period of first settlement of the Americas. The Clovis culture in New Mexico was one of the first to be assessed using carbon dating. While it at first appeared to originate between 13,500 and 12,900 years ago, following immigration from Siberia over the Bering land bridge, recent evidence indicates that Paleo-Indians were present in the Americas at even earlier dates. Agriculture is another focus of this section, as Mann explores Andean and Mesoamerican cultures. The agricultural development of maize from essentially inedible precursors like teosinte was significant for the rise in crop surpluses, populations and complex cultures, and pivotal in the rise of civilizations such as the Olmec. Mann notes that Mesoamericans did not have the luxury of "stealing" inventions from others, since they were geographically isolated in comparison to the cultures of Eurasia, leading to an absence of inventions that played fundamental roles in other cultures (such as the wheel) and also lacked domesticated large animals. "the Maya collapsed because they overshot the carrying capacity of their environment. They exhausted their resource base, began to die of starvation and thirst, and fled their cities 'en masse', leaving them as silent warnings of the perils of ecological hubris." Mann discusses the growing evidence against the perception that Native Americans were not active in transforming their lands. Most Native Americans shaped their environment with fire, employing slash-and-burn techniques to create grasslands for cultivation and to encourage the abundance of game animals. Native Americans domesticated fewer animals and cultivated plant life differently from their European counterparts, but did so quite intensively. The author suggests that limited and often racist views about the indigenous people, in addition to lack of a common language among the indigenous people, often led to a failure to recognize these dynamics, and has historically found expression in conclusions like the "law of environmental limitation of culture" (Betty J. Meggers) — whatever Native Americans did before slash and burn, the logic goes, had to have worked thanks to the vast expanses of healthy forest seen before Europeans arrived. Mann argues that Native Americans were a keystone species, one that "affects the survival and abundance of many other species". By the time the Europeans arrived in number to supplant the indigenous population in the Americas, the previous dominant people had been almost completely eliminated, mostly by disease, with a consequent disruption of societies and environmental control. Decreased environmental influence and resource competition would have led to population explosions in species such as the American bison and the passenger pigeon, and because fire clearing had ceased, forests would have expanded and become denser. The world discovered by Christopher Columbus was to begin to change from that point on, so Columbus "was also one of the last to see it in pure form". Mann concludes that we must look to the past to write the future. "Native Americans ran the continent as they saw fit. Modern nations must do the same. If they want to return as much of the landscape as possible to its state in 1491, they will have to create the world’s largest gardens." A 2005 The New York Times book review stated that the book's approach is "in the best scientific tradition, carefully sifting the evidence, never jumping to hasty conclusions, giving everyone a fair hearing -- the experts and the amateurs, the accounts of the Indians and of their conquerors. And rarely is he less than enthralling." 1491: New Revelations of the Americas Before Columbus. Knopf, 2005 ISBN 1-4000-3205-9. 1491: The Americas Before Columbus. ISBN 1-86207-876-9 European edition. Published in Europe by Granta Books on 6 November 2006. 1491: Una nueva historia de las Américas antes de Colón (Spanish-language edition). Seven Stories Press, 2013. 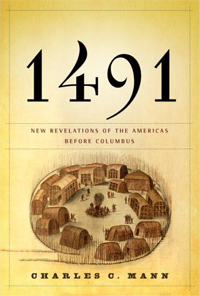 In 2011, Mann published his sequel, 1493: Uncovering the New World Columbus Created. It explores the results of the European colonization of the Americas, a topic begun in Alfred Crosby's 1972 work The Columbian Exchange, which examined exchanges of plants, animals, diseases and technologies after European encounter with the Americas. Mann added much new scholarship that had been developed in the 40 years since that book was published. ^ Baker, Kevin (October 2005). "'1491': Vanished Americans". The New York Times. Retrieved 8 December 2011. Charles Mann, "1491", from The Atlantic Monthly, March 2002. Original article that inspired the book. "An interview with Charles C. Mann" (Part 1, Part 2), from Indian Country Today December 20, 2005. Paper challenges 1491 Amazonian population theories, Argues, contra Mann, that the activities of pre-Columbian Amazonians did not reshape or "build up" the Amazon into its current state. Accessed August 18, 2008. University of Gothenburg (17 October 2010). "New discoveries concerning pre-Columbian settlements in the Amazon". EurekAlert!. Archived from the original on 10 November 2010. Retrieved 10 November 2010. Together with Brazilian colleagues, archaeologists from the University of Gothenburg have found the remains of approximately 90 settlements in an area South of the city of Santarém, in the Brazilian part of the Amazon. Michael Coe, "The Old New World", American Scientist, July–August 2006 issue. Mary D'Ambrosio, "The myth of an empty frontier: Explorers' diseases wiped out native populations long before settlers arrived", San Francisco Chronicle, August 14, 2005. This page was last edited on 23 February 2019, at 23:50 (UTC).